The triode (mercury-vapor filled with a control grid) was patented on March 4, 1906 by the Austrian Robert von Lieben independent from that, on October 25, 1906 Lee De Forest patented his three-element Audion. It wasn't put to practical use until 1912, when its amplifying ability became recognized by researchers. In 1920 wireless broadcasts for entertainment began in the UK from the Marconi Research Centre 2MT at Writtle near Chelmsford, England. A famous broadcast from Marconi's New Street Works factory in Chelmsford was made by the famous soprano Dame Nellie Melba on 15 June 1920, where she sang two arias and her famous trill. She was the first artist of international renown to participate in direct radio broadcasts. The 2MT station began to broadcast regular entertainment in 1922. The BBC was amalgamated in 1922 and received a Royal Charter in 1926, making it the first national broadcaster in the world, followed by Czech Radio and other European broadcasters in 1923. Broadcasting by radio takes several forms. These include AM and FM stations. There are several subtypes, namely commercial broadcasting, non-commercial educational (NCE) public broadcasting and non-profit varieties as well as community radio, student-run campus radio stations and hospital radio stations can be found throughout the world. Many stations broadcast on shortwave bands using AM technology that can be received over thousands of miles (especially at night). For example, the BBC, VOA, VOR, and Deutsche Welle have transmitted via shortwave to Africa and Asia. These broadcasts are very sensitive to atmospheric conditions and solar activity. 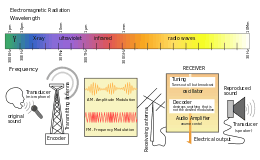 See shortwave for the differences between shortwave, medium wave and long wave spectra. 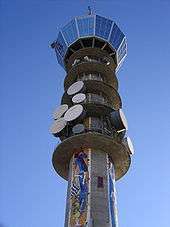 Shortwave is used largely for national broadcasters, international propaganda, or religious broadcasting organizations. AM stations were the earliest broadcasting stations to be developed. AM refers to amplitude modulation, a mode of broadcasting radio waves by varying the amplitude of the carrier signal in response to the amplitude of the signal to be transmitted. The medium-wave band is used worldwide for AM broadcasting. Europe also uses the long wave band. In response to the growing popularity of FM stereo radio stations in the late 1980s and early 1990s, some North American stations began broadcasting in AM stereo, though this never gained popularity, and very few receivers were ever sold. One of the advantages of AM is that its signal can be detected (turned into sound) with simple equipment. If a signal is strong enough, not even a power source is needed; building an unpowered crystal radio receiver was a common childhood project in the early decades of AM broadcasting. AM broadcasts occur on North American airwaves in the medium wave frequency range of 530 to 1700 kHz (known as the “standard broadcast band”). The band was expanded in the 1990s by adding nine channels from 1620 to 1700 kHz. Channels are spaced every 10 kHz in the Americas, and generally every 9 kHz everywhere else. The signal is subject to interference from electrical storms (lightning) and other electromagnetic interference (EMI). AM transmissions cannot be ionospherically propagated during the day due to strong absorption in the D-layer of the ionosphere. In a crowded channel environment this means that the power of regional channels which share a frequency must be reduced at night or directionally beamed in order to avoid interference, which reduces the potential nighttime audience. Some stations have frequencies unshared with other stations in North America; these are called clear-channel stations. Many of them can be heard across much of the country at night. During the night, absorption largely disappears and permits signals to travel to much more distant locations via ionospheric reflections. However, fading of the signal can be severe at night. Edwin Howard Armstrong invented FM radio to overcome the problem of radio-frequency interference (RFI), which plagued AM radio reception. At the same time, greater fidelity was made possible by spacing stations further apart in the radio frequency spectrum. Instead of 10 kHz apart, as on the AM band in the US, FM channels are 200 kHz (0.2 MHz) apart. In other countries greater spacing is sometimes mandatory, such as in New Zealand, which uses 700 kHz spacing (previously 800 kHz). The improved fidelity made available was far in advance of the audio equipment of the 1940s, but wide interchannel spacing was chosen to take advantage of the noise-suppressing feature of wideband FM. The original FM radio service in the U.S. was the Yankee Network, located in New England. Regular FM broadcasting began in 1939, but did not pose a significant threat to the AM broadcasting industry. It required purchase of a special receiver. The frequencies used, 42 to 50 MHz, were not those used today. The change to the current frequencies, 88 to 108 MHz, began after the end of World War II, and was to some extent imposed by AM broadcasters as an attempt to cripple what was by now realized to be a potentially serious threat. FM radio on the new band had to begin from the ground floor. As a commercial venture it remained a little-used audio enthusiasts' medium until the 1960s. The more prosperous AM stations, or their owners, acquired FM licenses and often broadcast the same programming on the FM station as on the AM station ("simulcasting"). The FCC limited this practice in the 1960s. By the 1980s, since almost all new radios included both AM and FM tuners, FM became the dominant medium, especially in cities. Because of its greater range, AM remained more common in rural environments. Pirate radio is illegal or non-regulated radio transmission. It is most commonly used to describe illegal broadcasting for entertainment or political purposes. Sometimes it is used for illegal two-way radio operation. Its history can be traced back to the unlicensed nature of the transmission, but historically there has been occasional use of sea vessels—fitting the most common perception of a pirate—as broadcasting bases. Rules and regulations vary largely from country to country, but often the term pirate radio generally describes the unlicensed broadcast of FM radio, AM radio, or short wave signals over a wide range. In some places radio stations are legal where the signal is transmitted, but illegal where the signals are received—especially when the signals cross a national boundary. In other cases, a broadcast may be considered "pirate" due to the type of content, its transmission format, or the transmitting power (wattage) of the station, even if the transmission is not technically illegal (such as a web cast or an amateur radio transmission). Pirate radio stations are sometimes referred to as bootleg radio or clandestine stations. Digital radio broadcasting has emerged, first in Europe (the UK in 1995 and Germany in 1999), and later in the United States, France, the Netherlands, South Africa and many other countries worldwide. The most simple system is named DAB Digital Radio, for Digital Audio Broadcasting, and uses the public domain EUREKA 147 (Band III) system. DAB is used mainly in the UK and South Africa. Germany and the Netherlands use the DAB and DAB+ systems, and France uses the L-Band system of DAB Digital Radio. Satellite radio broadcasters are slowly emerging, but the enormous entry costs of space-based satellite transmitters, and restrictions on available radio spectrum licenses has restricted growth of this market. In the USA and Canada, just two services, XM Satellite Radio and Sirius Satellite Radio exist. Both XM and Sirius are owned by Sirius XM Radio, which was formed by the merger of XM and Sirius on July 29, 2008, whereas in Canada, XM Radio Canada and Sirius Canada remained separate companies until 2010. Worldspace in Africa and Asia, and MobaHO! in Japan and the ROK were two unsuccessful satellite radio operators which have gone out of business. Radio program formats differ by country, regulation and markets. For instance, the U.S. Federal Communications Commission designates the 88–92 megahertz band in the U.S. for non-profit or educational programming, with advertising prohibited. ↑ Guarnieri, M. (2012). "The age of vacuum tubes: Early devices and the rise of radio communications". IEEE Ind. Electron. M.: 41–43. doi:10.1109/MIE.2012.2182822. ↑ Nebeker, Frederik (2009). Dawn of the Electronic Age: Electrical Technologies in the Shaping of the Modern World, 1914 to 1945. John Wiley & Sons. pp. 14–15. ISBN 0470409746. ↑ "The Invention of Radio". ↑ Guarnieri, M. (2012). "The age of vacuum tubes: the conquest of analog communications". IEEE Ind. Electron. M.: 52–54. doi:10.1109/MIE.2012.2193274. ↑ Baudino, Joseph E; John M. Kittross (Winter 1977). "Broadcasting's Oldest Stations: An Examination of Four Claimants". Journal of Broadcasting: 61–82. Archived from the original on 2008-03-06. Retrieved 2013-01-18. ↑ "Callsign 2MT & New Street". ↑ "BBC History – The BBC takes to the Airwaves". BBC News. ↑ Atgelt, Carlos A. "Early History of Radio Broadcasting in Argentina." The Broadcast Archive (Oldradio.com). ↑ "What is a Radio Station?". Radio World. p. 6. ↑ Halper, Donna L. "John Shepard's FM Stations—America's first FM network." Boston Radio Archives (BostonRadio.org). ↑ Miller, Jeff. "FM Broadcasting Chronology." Rev. 2005-12-27.